More about my services can be found on the Hire Heather page. To inquire about rates and availability, please submit the contact form here and choose the subject line “Interviewing Services Inquiry”. I have a 15-year history of interviewing celebrities and experts on TV, video, and online media. By now, the number of interviews I’ve conducted is well in the thousands, from just a few questions to several hours long. I am also the author of an extensive home-study resource called Interviewing Unwrapped. It teaches anybody, regardless of past experience, how to professionally interview experts to create high-quality online content such as information products, podcasts, online radio shows and teleseminars. 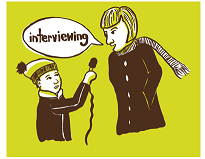 You can find more information on Interviewing Unwrapped here.